In part I, I reported that I refused to participate in a shoestring budget documentary project about my father being made by freelance video editor Jason Schmidt because he wrote me that was willing to accept funding from my father, his "sympathetic associates," and from "deep-pocketed patrons/benefactors" I might steer to him. In part II, I reported that my father's press agent, Melinda Zemper, wrote me that she issued a press release hyping the project and helped fund it via Kickstarter because she's personal friends with Schmidt whom she called "an ethical, competent journalist." The Kickstarter campaign raised about $32,000 in July. It also raised questions about the responsibility of Kickstarter recipients to those who fund their projects. The fund raising pitch stresses that the filmmakers "believe in this story." That claim is undermined by this example that suggests Schmidt may not even have a grasp of the basic material. 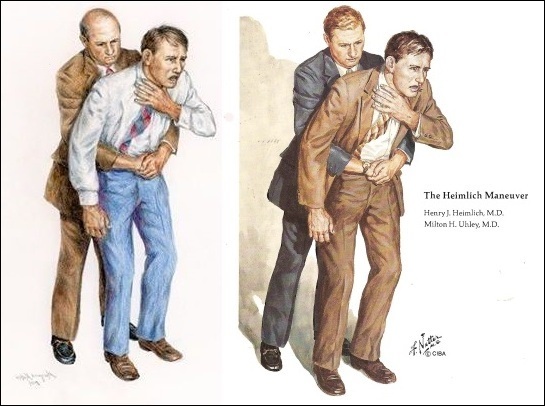 In fact, the American Heart Association and the American Red Cross incorporated the Heimlich into their choking rescue guidelines in 1976, only two years after my father introduced the treatment. By any measure that's a remarkably rapid acceptance for any new medical treatment. It's also a milestone that anyone who had done even cursory research into the history of the Heimlich maneuver would know. (In 1976, the Red Cross) changed its policies, advocating that people use both back slaps and what it called “abdominal thrusts.” By “abdominal thrust,” the organization meant the Heimlich Maneuver. In a recent e-mail, I asked Schmidt which of "the biggest organizations in the medical establishment" his fund raising pitch was referring to. I'd be happy to look over any information you have regarding that subject. In other words, Schmidt learns from yours truly that his project may have used a false claim to raise funds. In response, he provides no information to back up his project's claim. Instead, this so-called "ethical, competent journalist" asks me to send him information. If that's how much Schmidt "believes in this story," Melinda Zemper may want to ask her friend for a refund. Call me a stickler-in-the-mud, but I have a problem with the film having a business relationship with my father. But at the moment that's a secondary point. My main point is that Schmidt apparently hasn't read my father's book. If he had, wouldn't he have known that the treatment was almost immediately accepted "by the biggest organizations in the medical establishment"? Here's a fair and perhaps loaded question. After a Kickstarter campaign ends, if the recipients learn that the campaign included false information, should they inform donors? The above example may be a case in point. Here's a screen shot of information prominently posted near the top of the Kickstarter page. 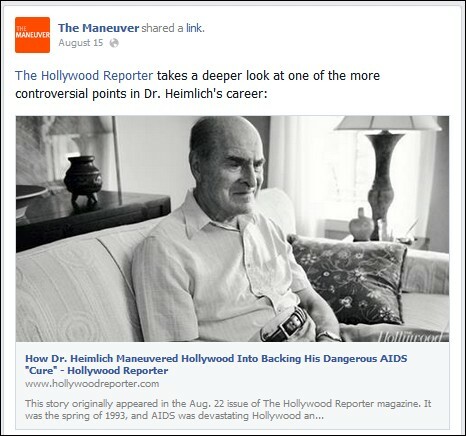 As Sidebar readers know, via Seth Abramovitch's scorching August 14 Hollywood Reporter report, How Dr. Heimlich Maneuvered Hollywood Into Backing His Dangerous AIDS "Cure," actress Halle Berry has denied the claim. Are the "collection of talented colleagues and friends" and family members making the film (see below) aware of the Hollywood Reporter article? If they read their own Facebook page, they are. 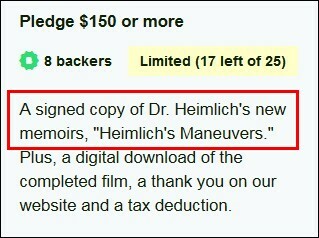 If they've read the THR story -- and I think's safe to assume Schmidt did -- then they're aware that the Halle Berry claim on their Kickstarter page is apparently a lie. So should their Kickstarter page be corrected? And should donors be made aware of the false claims? Or is Kickstarter a "caveat emptor" operation? I'll start asking questions and will report the results.